At the end of the day, how much is it going to cost to build? Visual 3D Material Take-offs simplify the process of estimating and makes it a more visual process – you can see what you are estimating. We will explore the process of doing a visual residential take-off, give examples of how it works and end off with the benefits of estimating in a visual 3D environment. First, the builder may also be the designer, in which case they can use the original file, like an Envisioneer™ design file, to generate the estimate. Second, a PDF of the floor plan and elevation is provided. Or third, it may be a hand drawing arriving in paper format. 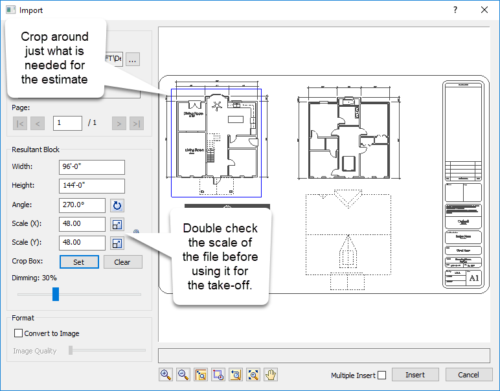 If the original design file is a pdf, dwg or dxf file it can be used directly in programs like Envisioneer Building Essentials™ or Envisioneer Construction Suite for a visual take-off. Using that original file provides a solid starting point. During the import procedure there are tools available to ensure accuracy and simplify the information used for the estimate. For example, you can double check the scale used by the designer for accuracy. Estimating using a 1/4-inch scale listed on a drawing sheet when it actually should have been 1/8 inch can be a very costly oversight! You can also crop around just the areas you need to estimate and rotate to any angle that works best for you. Once these initial steps are completed, the estimating work can begin. These initial steps ensure that what you are basing your material report on is as accurate and useful as possible. Now select specific elements to take-off. 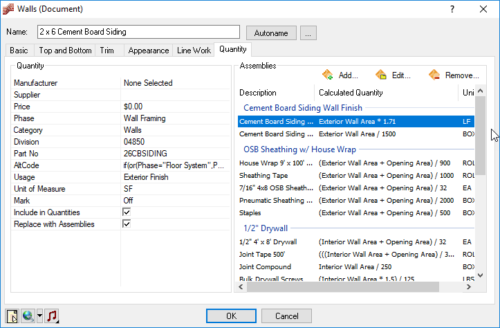 It’s as simple as tracing around exterior and interior walls in the pdf and it simultaneously calculates the finish, framing materials and even gallons of paint required to build the wall. Pick windows, doors and openings to insert and not only do they get included in the material take-off, but they also frame around the opening. 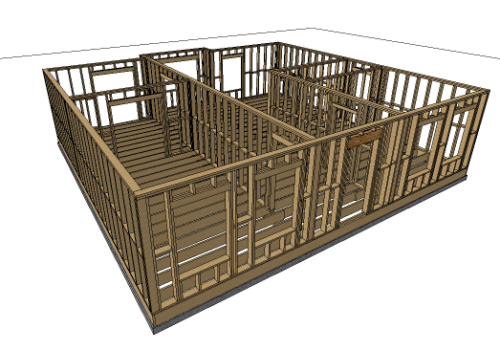 The process is like the manual hand method of measuring and highlighting a printed blue print but this way it virtually builds and frames the walls, calculates the linear feet of trim, and reports back any finish materials and fasteners all at the same time. Detailed formulas are used to drill down to extremely accurate and efficient estimates for materials like drywall tape, where factors like linear footage play a big part in the estimate. Waste factors can also be added to the formula for each building element, further enhancing the accuracy of the estimates. You have access to the formulas, so you can refine them to match your usage on site. If the original design was done by hand and all you have is the printed working drawing sheets, you can use the same tools but instead of tracing the walls you can type in the measurements of each wall as you indicate which direction it is going. Envisioneer™ will build the walls to match your input. Same estimated values just a different input method. You want to ensure that your estimating tool is flexible to allow for many different input methods depending on the information that you receive. At the end you have an estimate of the materials that can be organized into different headings and printed or exported into a variety of formats. For building supply centers this means they can link the data to the POS, the heartbeat of their business. For builders using Excel or a construction management software the information can be shared and used for scheduling purposes. Or simply print it out to order the products or use it for your quote. Using 3D views will help ensure you aren’t forgetting anything. The ability to constantly check the model to see how materials are being used will make sure the numbers you’re pulling are correct, helping to avoid costly mistakes. 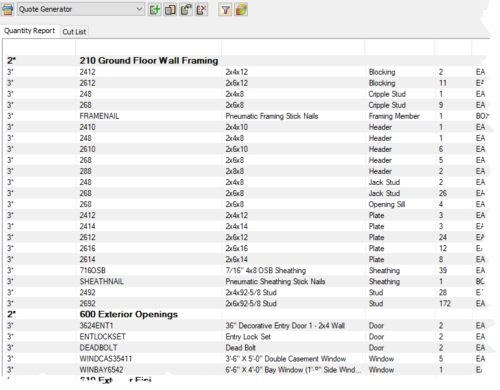 Documents can be provided directly to the builder to show exactly how the materials are being used, allowing for more efficient material management on the job sites. Seeing a 3D rendering of what each element of the home should like after it’s built helps ensure that each piece of material is being used appropriately. Each wall can be printed as an individual wall framing panel diagram that labels each board used. 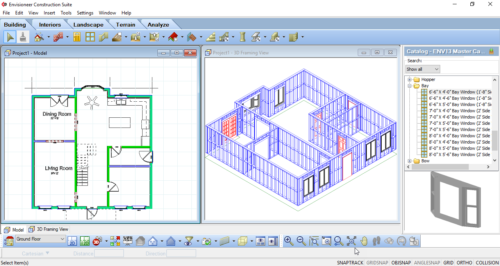 This is a feature found only in Envisioneer Construction Suite. Be it track housing or custom homes or a reno project, the convenience and accuracy of using virtual estimation allows builders and building supply centers to organize their shipments and builds into one very accurate process. This, in turn, boosts accuracy and efficiency, both of which will translate to faster builds and higher profits. Download a trial to test drive it yourself!